For Big Sky Town Center, client Ryan Hamilton envisioned a town that felt like it evolved organically over time to fit community needs and location. 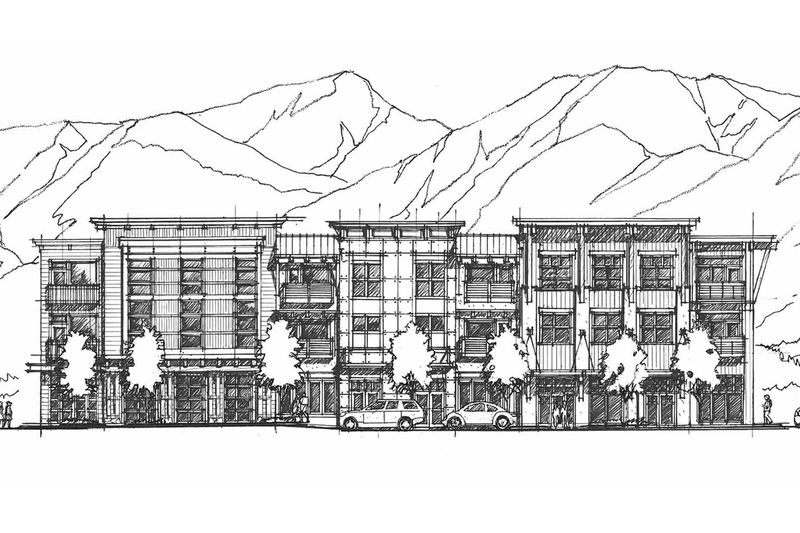 Views from the development were considered and roads aligned with vistas to Lone Mountain – a predominant ski hill – and Big Sky. The new urban development design approach emphasizes pedestrian traffic, rather than vehicular. Three distinct zones outline ideal development densities. Residential development on the outskirts transitions from single family to multifamily as it approaches the two commercial zones. A neighborhood commercial zone includes varied and unique building styles and the commercial core creates a Main Street type 0 lot line experience: the ground floor features stores, restaurants and bars, while the upper floors predominantly house offices and residences. Two gathering spaces encourage community. The Fireside Plaza to the west features a fire pit and is used for various activities and events, including Christmas celebrations and the Big Sky Farmers Market. The other plaza caters to larger groups and will support an ice-skating rink and music events. The primary hotel and restaurant bar venues will be located around this Town Center Plaza. To the east of the commercial core is additional neighborhood commercial zoning, which includes grocery, brewery, hospital and retail functions. Scott has been invaluable for more than a decade in helping us define, guide, and execute the vision for the Big Sky Town Center, a 165-acre mixed-use project in Big Sky, Montana that is presently about 50% built-out. His pragmatic approach to design and construction helps sets him apart from other architects. He is a consummate professional with expertise in all aspects of architecture including exteriors, interiors, colors, textures, site, landscape, human interaction, scale, grading, and much more. We look forward to working with him and his team for many years to come.